This past weekend I actually had some fun, like real adult fun! Can you believe it? I can’t. My friend came over and we drank and played silly games, it was a blast. I have not had the opportunity to drink or just relax with friends since before I even got pregnant. This was a real treat, we have decided we are going to make it a somewhat regular thing. It made me realize how little time I spend having fun ( I obviously enjoy spending time with my son, you know what I mean though). I know I am never shy to say how hard I work, how stressed out I am, or how lonely being home alone every day can be. Especially when I am often stuck at home even if the opportunity to go out arises with some health conditions of mine. After Saturday night though, I felt it full force. It hit me, I felt the full emptiness that comes with the realization that I am so very often completely alone. It’s kind of sad sometimes. I will call my grandma or my Mom for no real reason, just to hear an actual grown person speak to me. Even if only for a minute because we really had nothing to say. Not that I am writing this to tell you how pathetic I am, it is just relevant to the point I am about to make; I promise. I felt the need to state again to all of you how important it is to take care of yourself in every way. Even in ways we sometimes forget are good for us. It is important to be social, have friends, do things you enjoy, and be silly when you can. I am so type-A I cannot even stand it half the time, it is hard for me to let go and just have fun. Honestly, I think I forget how to do it. I did a good job of it Saturday night though and it was such a relief. I actually felt like a proper 23-year-old. Is that a thing? I feel like I am much older than my peers most days; I don’t feel like I had the same experiences as them. I was never one to go out and be stupid, I never went to a party as a teenager, I didn’t make any real or close friends in college (both programs I attended), and I generally kept to myself. It was probably my own fault but it took away from my ability to do it now; my ability to let loose. Now being a Mom my work day never ends and that takes a toll all its own. I have realized that by taking small steps and carving that “Me Time” out for myself allows me to have my cake and eat it too. The secret is to just make cup cakes! I think of it like this; with a box of cake mix you can either make one cake or lots of little cup cakes. What better way to think about having it all, right? Set time aside for yourself, I know it can be difficult most days. It can feel impossible every other day but it is vital. You cannot care for others if you first do not care for yourself. Being a parent is stressful, you deserve time to unwind. Please take it in any way you can. Even if it is just 15 minutes a night after the kids are in bed; read a book in the bath with a glass of wine or invite a friend over to watch a movie. Just do something for yourself, you are important and you deserve it. Let me know how you like to spend your time! 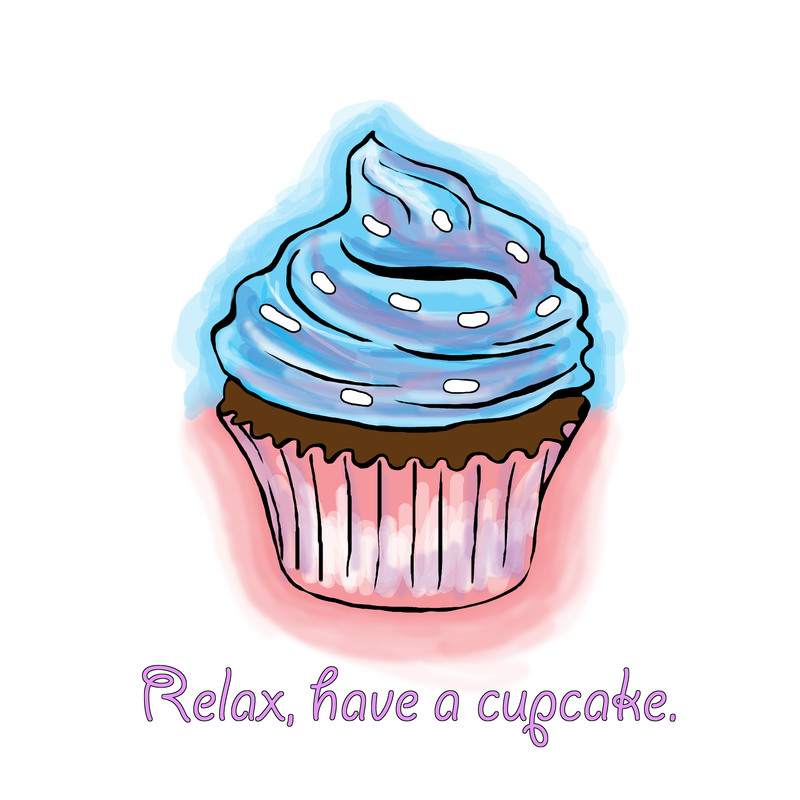 Also, if you are interested in the Cup cake picture above it is one of three different cup cake prints available on my Society 6 store. They can be prints or put on things like t-shirts, pillows, and mugs! Check it out here (They also have free world-wide shipping going on until January 25th, 2015 at Midnight (PST) )! It certainly is. Unfortunately I’ve noticed it is also hard to keep the same friends. All too often I’ve seen friendships fade when someone has a kid. Not to scare people into having children, it is wonderful. You just learn a lot about yourself and who should be in your life. I was lucky to not really have that happen to me but I see it a lot. Been there totally done that! During the early years when my kids were little it did take effort to spend time being an adult. I’ve found over the years theres the wife, mother, daughter, sister and then theres me. In life you must make time for all of you. Great post cheers! That’s very true. Which was where I was trying to go with my cup cake thing. You have different parts of you and different things you have to do, etc. You have to set time aside for it all and not lose yourself in the process! It is so easy to put the cup cake labeled “Me” aside for later but then later never comes and it ends up in the garbage. I think this is such an important realization to have. From one Type-A personality to another, I completely understand the inability to let yourself go and not have complete control over a situation. That is why it is so important to surround yourself with friends, family etc., so they can remind you that getting out of your shell feels good! I am a mommy in the same boat toooo…its been long i got to have some me time or some fun time with my ladies!!! Like you said its really really important to find the time for yourself to keep yourself sane! !